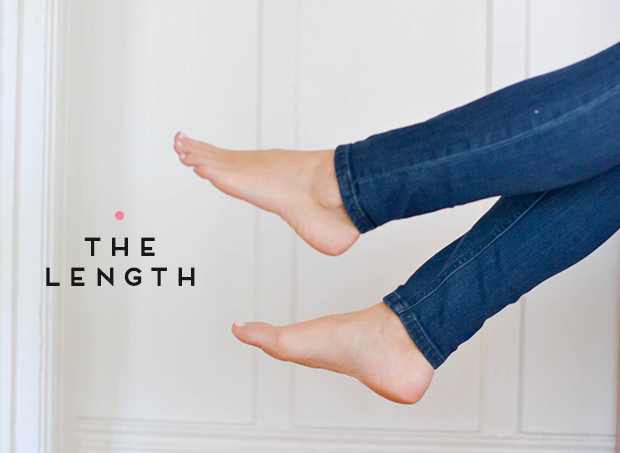 First, your jeans need to be the right length. I recommend ones that hit midway down the ankle. This way they aren’t too long that there’s extra fabric, or too short that you can’t have some fun rolling them. What socks should I wear? 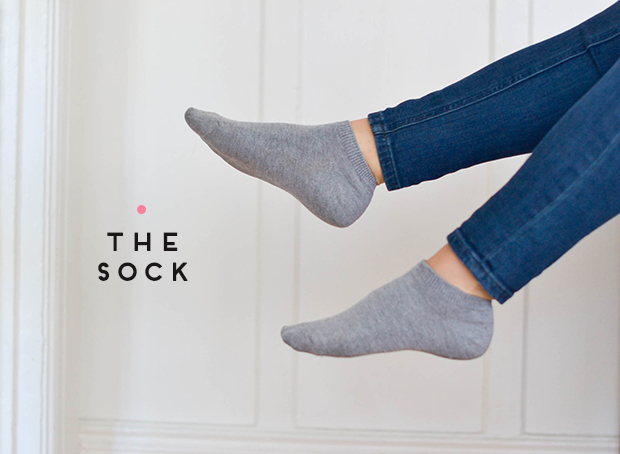 The perfect sock to pair with your booties has to be the ankle sock. Opt for a simple pair, not ones you workout in, just something simple. I usually choose darker colors in case you can see the sock a tad inside your boot. My go-to socks for booties are the Classic Ankle Socks from Gap. 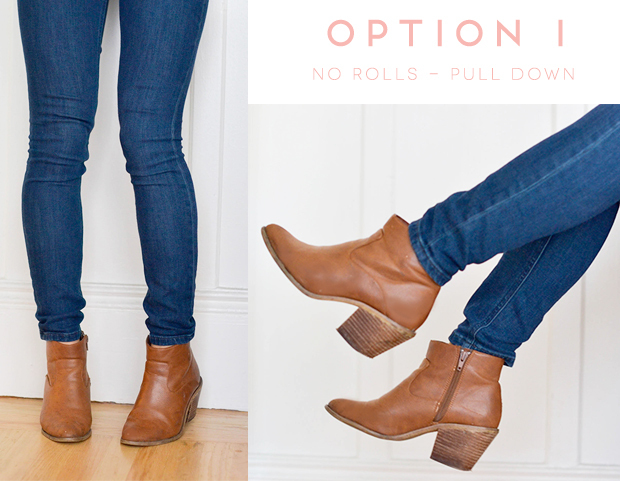 How do I wear booties with skinny jeans? 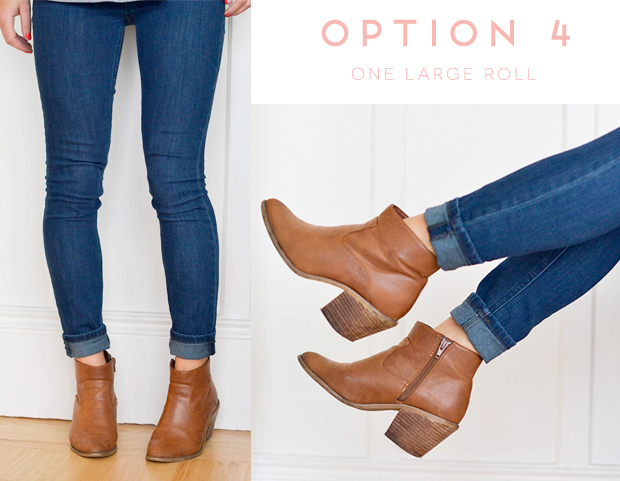 If your jeans are the right length, you should be able to wear them with your ankle boots without rolling them. Just pull the jeans all the way down so any extra fabric is scrunched at the bottom. Let the jeans fall casually onto the boot – some of it might fall inside the boot, some may be left outside. Just a sliver of skin should show. If your jeans are the right length, they will look fine. If there is too much fabric at the bottom when you pull your jeans down, you can also scrunch them up. Since these are skinny jeans, you can pull them up so more fabric sits around your knees and lower thighs. Pull your jeans up so that no more than 1.5 inches of skin is showing just above the boot. 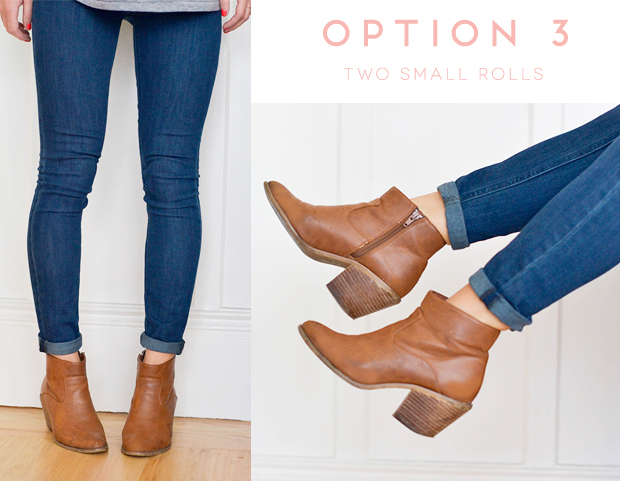 My favorite way to wear booties with skinny jeans is to roll the bottom of the jeans twice. Keep the rolls nice and small for a seamless look. You should leave about 1 inch of skin showing just above the boot. 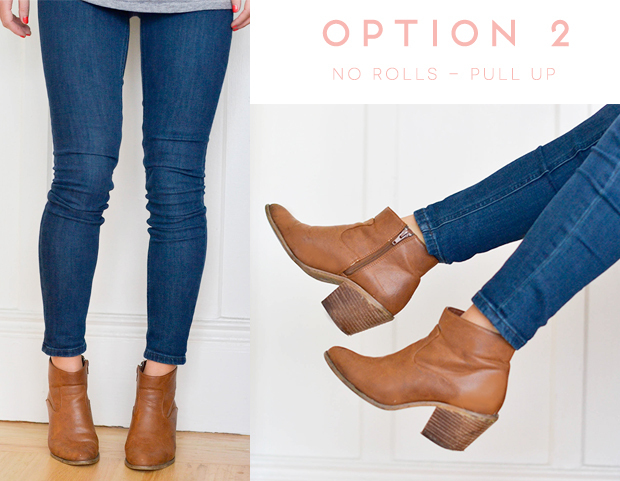 Another fun option is to just cuff the jeans once. If your jeans are too long, this won’t work – the cuff should be no more than 2 inches. Leave just an inch showing above the boot. Now here’s what how you shouldn’t wear booties with skinny jeans. 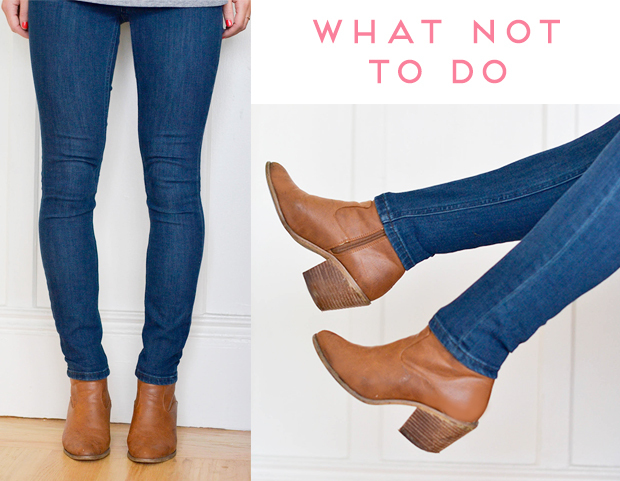 Avoid pulling the jeans over the boots so that no skin shows. This may just be a personal preference, but I’m just not a fan of this look. Booties available in black here. Similar ones here. I always wear my booties with one roll, but I’ve been getting a little tired of it, so this post comes at the perfect time for me. I was also wondering what brand those jeans are? I love them and am always looking for good jeans. I love this post! So very helpful! No I need to hit the mall! Finally! All my questions answered! I definitely think the last look isn’t the greatest but I have seen it before, on myself as well, and it doesn’t look too bad if you have the right skinny and the right boot. I’m all about your posts that give options. Love them :). ahhhhh i have totally worn my jeans over the booties. Fail on my part. Thanks for the tips! 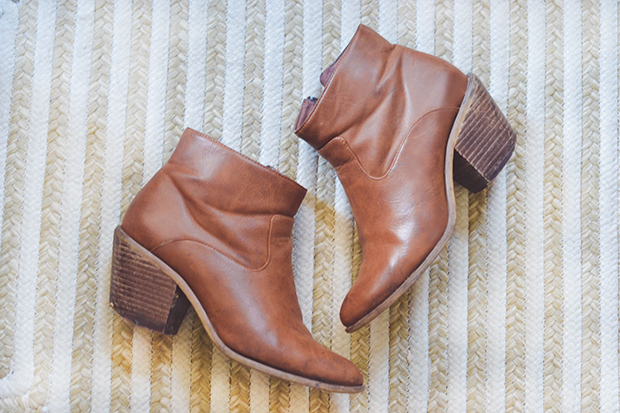 What would you recommend for ankle boots that have a large cuff themselves? Would double cuffing (if you cuff the jeans too) be a nono? best I have found out till now. But, what in regards to the bottom line? the bottom line? Are you pksitive concerning the supply? Wow, incredible blog layout! How lkng have you ever bedn running a blog for? you made running a blog glance easy. The overall look of your web site iss great, as smjartly as the content! and increases circulation. Just continue the exercise until you reach your desired neck structure. Selecting the service providers will make sure that you get your designing needs fulfilled at reduced cost. However, there are people who are born to have double chin. meter so it is important to put your best effort here. list of paying survey sites. I don’t bother with referrals, or complicated downlines. to counsel you some fascinating things or advice. it’s very hard to get that “perfect balance” between user friendliness and appearance. I feel that you could do with a few percent to force the message house a little bit, but instead of that, this is fantastic blog. a website or I have something to valuable to contribute to the conversation. Hi there! I simply wish to give you a huge thumbs up for the excellent information you have got here on this post. Hi there, simply changed into alert to your blog through Google, and found that it is really informative. you proceed this in future. A lot of other folks might be benefited out of your writing. while learning mmuch more or understanding more. Thank you for excellent information I used to be on the lookout for this info for my mission. to Wear Booties with Skinny Jeans. And I actually do have some questions for you if it’s allright. their desired products and services. For latest news you have to go to see internet and on internet I found this web page as a best web site for most recent updates. called Le Carnet Gourmand, which lists around 200 restaurants in Paris, who are registered with the Tourism office. with the customs, traditions and lastly, the society and it is norms. be the culture section per destination. It also carries a fountain and tranquil garden from the cloister. games, educational software, educational programs, tutors wanted, etc. Advertising on the newspapers is also cheaper than advertising on mediums such as television and radio. 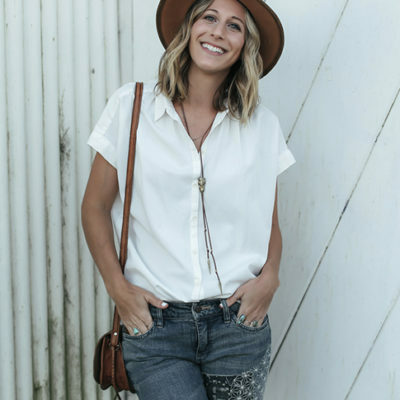 I bought some boyfriend jeans was so excited to wear them with my new ankle boots but I looked frumpy and silly so I went on a search and found this site and now I understand why I looked so stupid my boyfriend jeans are to long! Do you suggest I cut them? I want to wear them cuffed!!! So glad I found you!!! I wore some skinnies with new ankle boots to work today and didn’t know how to style them. Cannot wait to read the rest of your blog! Hi I really love your blog and am looking for some further bootie advice. I am a stay at home mom and have very little time to shop so I was hoping you could suggest a few cute black bootie options. Ones that I could wear every day (I don’t get dressed up that much any more! ), with jeans, or slacks, or leggings. Low heel is preferable. Thank you so much! Hi! I was just wondering if you’d be willing to share with us where you got your booties as well as where your jeans are from? Love them both! May I ask where you purchased your booties? I love them! I was wondering where your jeans are from?! They’re really cute and I’ve been looking for some in that shade/length. I now this blogpost is kind a little older, but never the less still so helpfull. as a huge fan of your blog, I was strolling around your posts and stayed here. not for the advice how to wear jeans with boots, but because I’m a small women who almost never fit into standard trouser length. your option 2, the pull up, was a light bulb moment for me :D now I usually tend to wear my skinny jeans this way, no matter I choose boots, loafers or mules! I’m so glad this was helpful to you!! Let me know if you ever need any other advice on petit fashion. You should also check out my friend’s blog View from 5’2″! immediately hopped over to Christine’s blog an have to approve it’s such a nice collection of fashion advices for smaller women. What boots are those- LOVE them! This is helpful, however I can’t find any resources on what to do in cold winter months. I follow these guidelines now, but when it gets below freezing I don’t want to expose skin. And with tall riding boots on their way out of style (if not already), what’s a girl do to stay stylish and warm? I got you, girl! Check out my post on how to wear socks with ankle boots here. Who cares if you wear the jean over the boot? If you think you look great or like the look or are comfortable wearing the look I say do it. Don’t live your life because its what everyone is doing, live it like YOU want. Enjoyed your helpful hints. Is this advice good for seniors? I really enjoyed reading looking at your images, they are well taken and self explanatory, There is one question though if I may ask, Is it always necessary to show a little bit of skin when wearing ankle boots? I mean can’t I just wear it over the jeans? Thank you for your advice. I have a great pair of black ankle boots by la canadienne -style Shelby. I’m finding it difficult to wear because they cover my ankle. Any suggestions? Awesome! Just the advice I needed. Bring a mum now, and been out of the fashion loop, I really needed to confirm how to wear my super new booties with my skinnies. Having the jeans finish just before the boot top made sense, but worried I was too out of touch to trust my thinking ? I like to think I can still rock this look! Check out my Blogging 101 section! It’ll have all those answers :). It’s really a nice and useful piece of information. I’m happy that you simply shared this helpful information with us.